As you probably know, I look at a lot of marketing emails. And I’m always amazed by how often people ignore the email signature line. 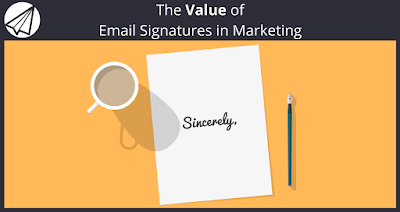 In fact, it’s one of the most valuable spots in the email, and the great thing is, once you create your signature, you don’t have to rewrite it again and again. It’s there, ready to go out with your next email. You’re probably wondering how you can go beyond your general signature and add some value to the bottom of your email. I’ve spent some time digging up some out-of-the-box ideas you can use to add value to your email signature. Case studies are powerful from a marketing perspective, but they don’t make the most compelling emails. I have to admit that I don’t always open up emails about case studies, but if an email’s content grabs my attention, I’ll click on a case study link in the signature line to find out more about what the company can do for me. Case studies are an excellent way to show your readers that you aren’t all talk. They prove you can put your plan into action and get results. You can use your case studies to highlight your skills and tools and show off your expert status. No one will click on that. Instead, use an example like this and put an enticing statistic next to the link. When I saw that link, I wanted to click on it and get more information. A 400% jump in organic traffic is a huge increase so I wanted to see the case study that backed up the statistic. If you can create the same type of signature line, you’ll be in business. Testimonials have an 89 percent effectiveness rating so you can expect to boost your sales when you add a word from your customers to your signature line. You need to be concise with your testimonials, though. It doesn’t make sense to use a testimonial that’s a paragraph long in your email signature. Save that for your website. Follow the format used in the example below. Notice that each testimonial is short and to the point, and not only identifies the customer by first and last name but also gives additional identifying information. That adds some legitimacy to the testimonials. Did you know that 81% of online consumers conduct research before taking out their credit cards? Use your email signature to help them along. You can include some links that explain how great your product or service is so they’ll know they need to spend their money with your company. Jennifer Nordine of ToutApp, Inc. does an amazing job of this. Your business might not be as accomplished as ToutApp, Inc., but you can still point people toward articles that highlight your products and services. The less legwork people have to do when researching your company, the more likely they are to come back and make a purchase. If you have a digital product, you can use your email signature to market it. Consider offering a free trial inside of your signature. This type of passive marketing is a great way to get the word out about the product. Create a banner with a CTA button that people click on to claim the offer. Put it right underneath your email signature. Then, if people click on the offer, they go to your trial. 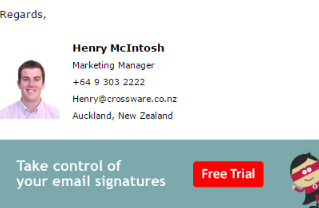 I love this example from Crossware Mail Signature. It’s bold and stands out, and it makes you want to take action. As you can see, your email signature is another email marketing opportunity. There is a lot of value in that small piece of virtual real estate. Start taking advantage of your email signature today and sign up for a free trial of Sendlane™. What was your favorite example? Did I leave something out that you use? Let me know in the comments below. We love writing new content for email marketers each week. Please help us spread the word by liking and sharing this post on your social media platforms using the buttons at the bottom of this post. Thanks!